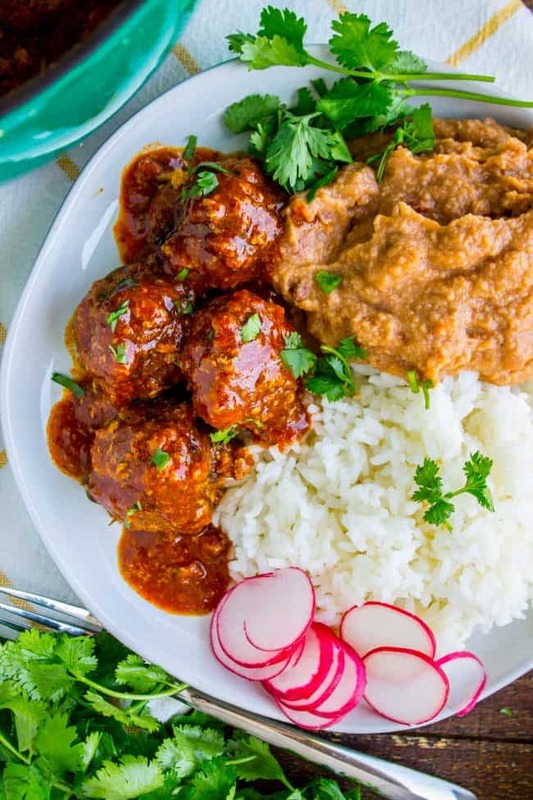 These Easy Baked Mexican Meatballs are packed with roasted poblanos and cilantro, and served in thickened enchilada sauce! 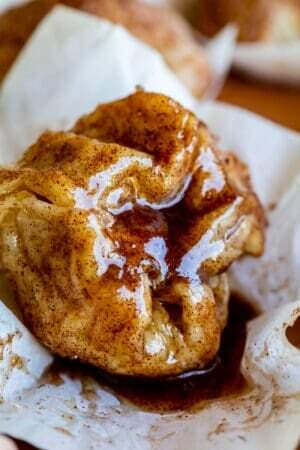 They are perfect with rice and beans for an easy weeknight dinner, or served with toothpicks as a cocktail or game-day appetizer. 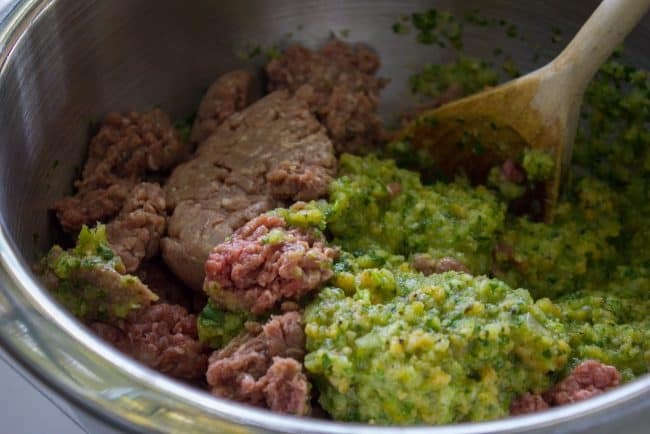 A couple years ago my mother-in-law Kris was visiting and we found this meatball recipe in a Southern Living magazine. I haven’t made them since, but we have talked about them multiple times since then. Any time you remember a meal like that, you definitely need to save that recipe. Crushed Fritos are where it’s at, yo. You can use any breadcrumbs you like of course, but Fritos give it that punch of corn flavor, like there is a corn tortilla all wrapped up inside your meatball. Look at this beauty just out of the oven. And voila! 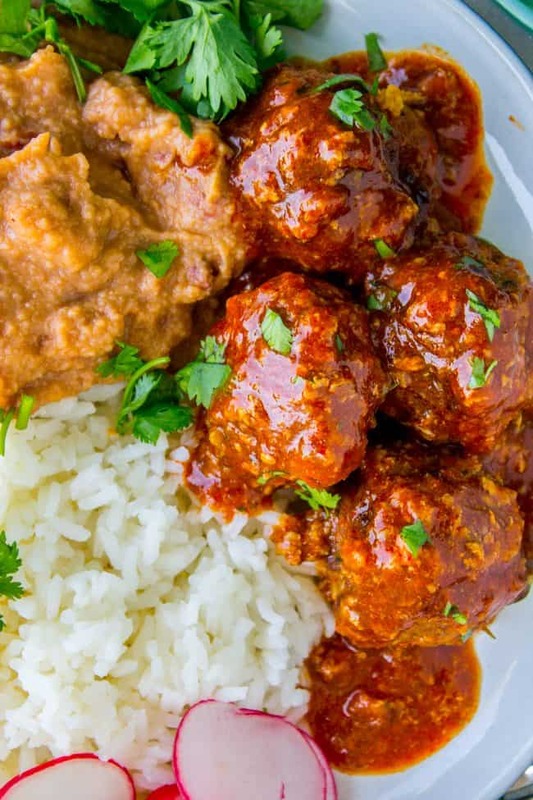 The most delicious Mexican meatballs of your life. SO much flavor in these, you guys, and they are super easy to throw together. You can tailor this to your tastes by what enchilada sauce you choose to get, spicy or mild, red or green, whatever floats your boat. Turn the broiler on to high heat and arrange the top rack to be about 5-6 inches below the heat. 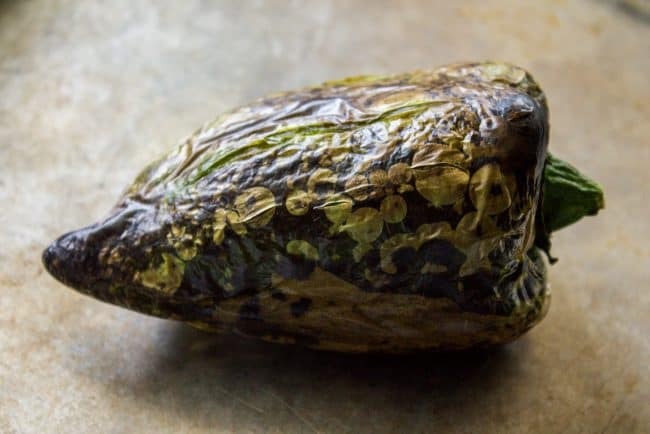 Place the poblano pepper on a bit of foil on a baking sheet. Broil for about 6-8 minutes (depending on the size), making sure to turn the pepper every 1-2 minutes with a pair of tongs. The pepper is done when the skin is blistered and blackened. Remove the pepper and place immediately in a sealed ziplock bag. 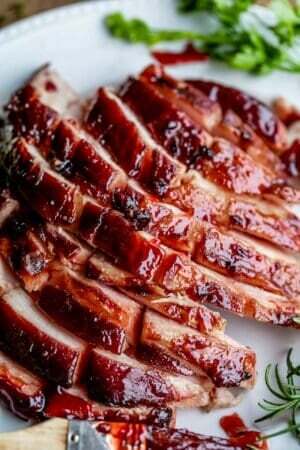 Let it steam for 10 minutes. After 10 minutes, open the bag and peel off the skin. Remove the stem and seeds. Line a large baking sheet with aluminum foil. Spray with nonstick spray. Set aside. 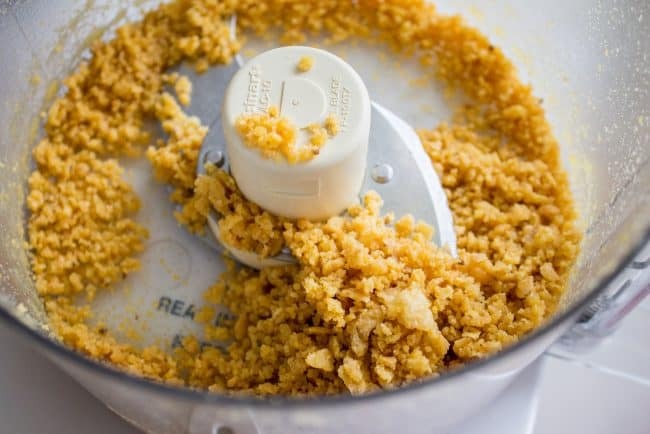 Meanwhile, use a food processor or blender to crush the Fritos into small crumbs. You need about 1/2 cup crumbs, I started with about 1 and 1/2 cups whole Fritos. Place the crumbs in a large bowl and add 1/4 cup milk. Stir it together and let it soak for a few minutes. Don't bother washing the food processor. Add the onion, garlic cloves, cilantro, and the roasted pepper (with skin, seeds, and stem removed). Pulse until finely chopped. Add the poblano mixture to the bowl with the Fritos and stir it all together. Stir in 2 eggs, 1 and 1/2 teaspoons salt, and 1/2 teaspoon black pepper. Use your hands to fold the ground beef into the bowl. Mix until just combined and then stop. 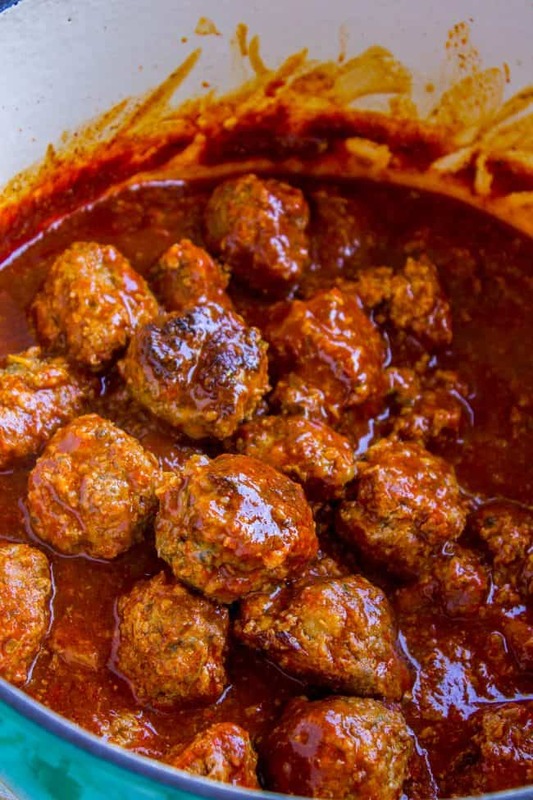 You don't want to end up with overworked, tough meatballs. 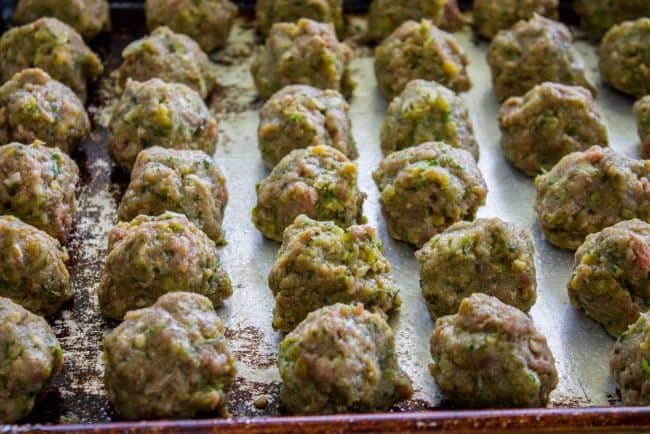 Shape the meatballs into 1 and 1/2 inch meatballs. You should get about 35. Just make sure they are all about the same size. Bake at 400 for about 10-12 minutes, until they are lightly browned on top. Meanwhile, in a large pot on the stove, add the enchilada sauce, chicken broth, and sugar. Bring to a simmer over high heat. Whenever the meatballs are done, lift them from the pan with a fork (try to scrape off as much of the fat on the edges as you can) and add to the pot of sauce. 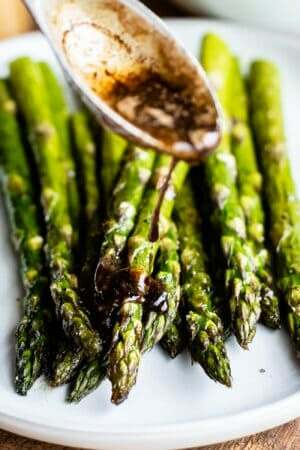 It doesn't matter if the sauce is still cold, just throw them in. Bring the meatballs and sauce to a boil over high heat (don't stir much, you don't want to break all the meatballs. Just scrape your spoon along the edges and on the bottom of the pot. Simmer over medium heat for 15-20 minutes until the sauce has thickened. 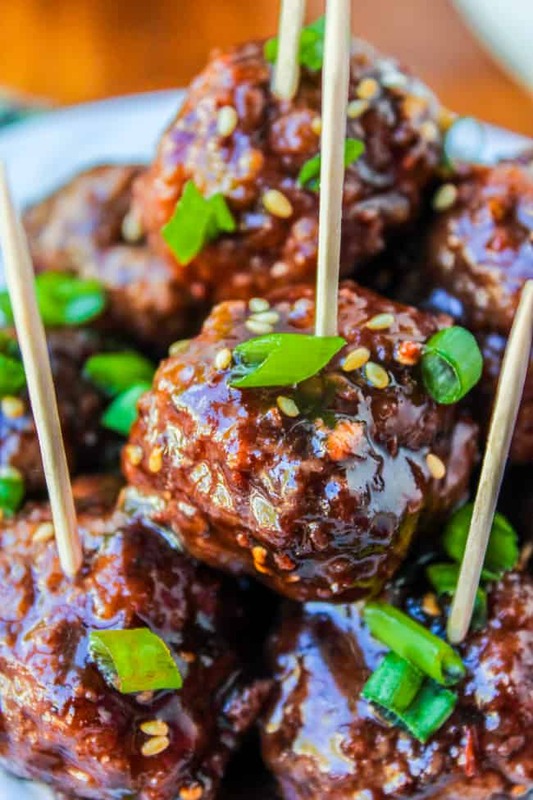 These meatballs are delicious served as an appetizer with scoop Fritos! The meatballs themselves are pretty mild. If you like a lot of heat, buy spicy enchilada sauce. Mild sauce would be delicious too. 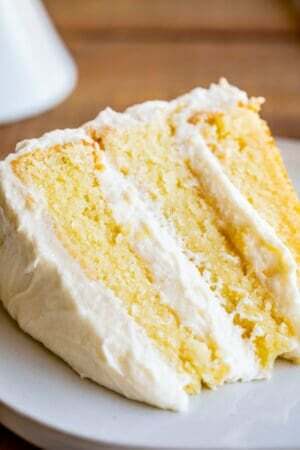 I found this recipe in an old copy of Southern Living! 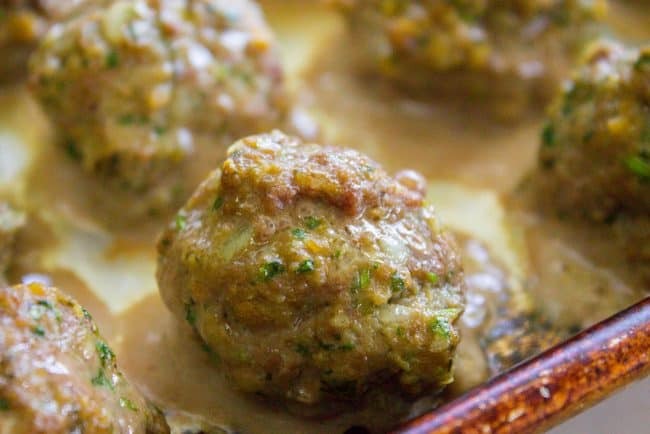 More meatball recipes you will love! 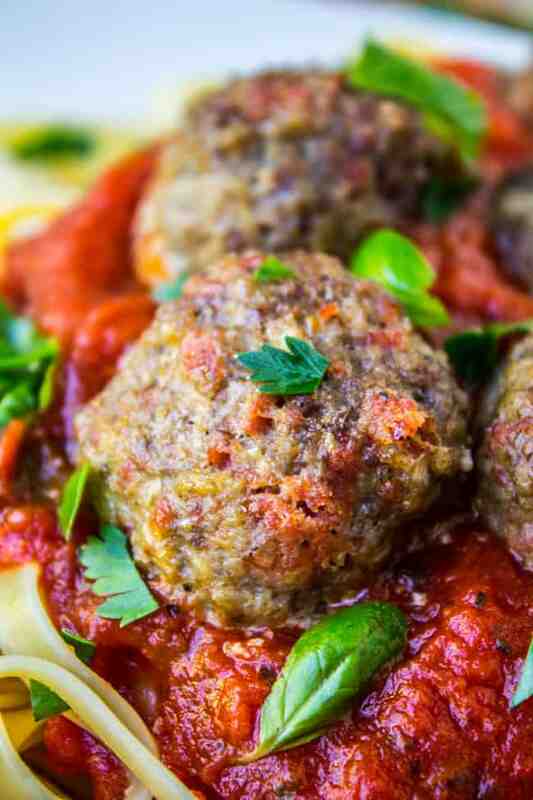 Easy Baked Meatballs << This is my go-to “basic” recipe. You can pair this with any kind of sauce you like. 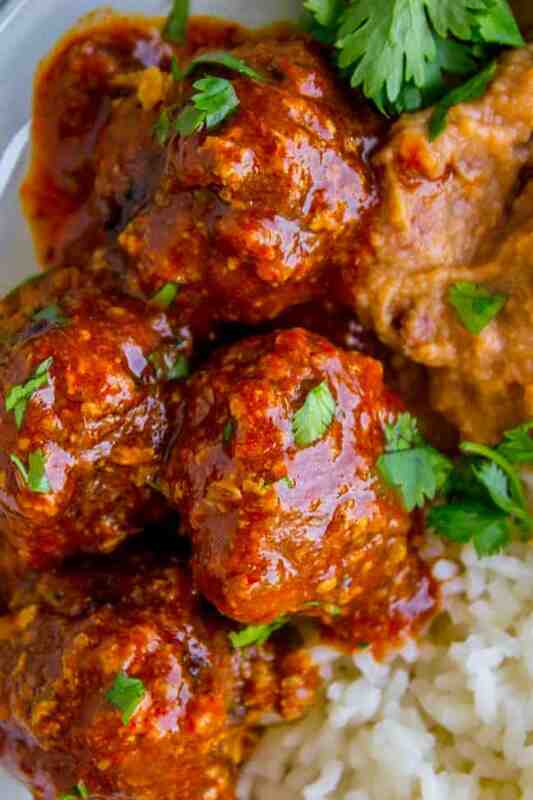 Raspberry Balsamic Meatballs (Slow Cooker) << these are really good as a meal or with toothpicks at a party! Pepperoni Meatballs << these taste like pizza! So good! 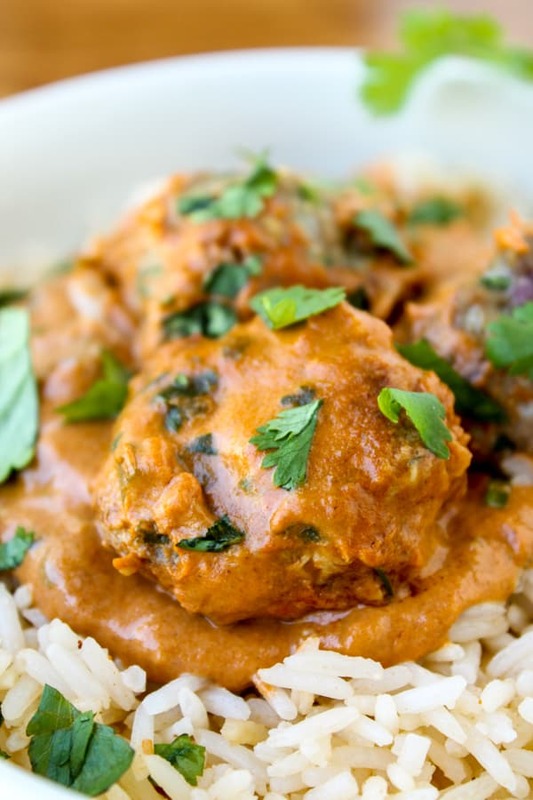 Chicken Tikka Masala Meatballs << I loooove these. 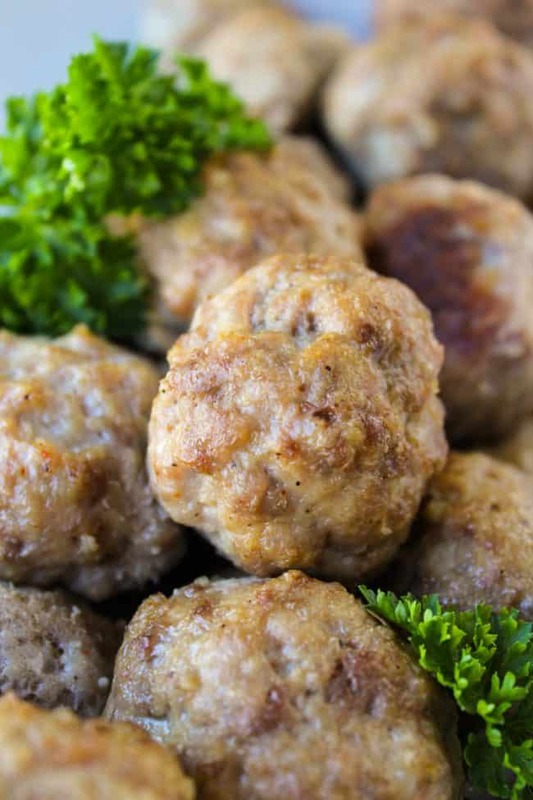 More meatball recipes from blog friends! OK, Karen. These are just the best. Tender, flavorful meatballs and the sauce was delish. I’m a Texan that’s been living in Singapore for the last 5 years. Gotta get my Mexican fix once in a while. Can’t get poblano peppers here, so subbed roasted red pepper from a jar and just dried it off. It may make the recipe a bit quicker (or less intimidating) for some. Can’t get Fritos either, sadly, but Mission Tortilla Strips worked for me. I used homemade enchilada sauce. You guessed it–can’t buy here in the cans. But homemade is much better anyway. 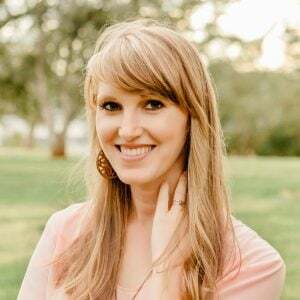 Karen, you are one of my favorite bloggers. I keep returning to your surefire recipes. Thank you!!! You are so sweet Jeanne! Thanks for saying that! It makes all the hard days worth it! :) I’m so glad you were able to adapt this recipe with ingredients you could find, you’re a genius. Love the jarred roasted pepper idea. I might try that next time I’m feeling lazy!! Love the Fritos in these. Because I can’t leave any recipe alone, I added a 1/2 tsp of cumin to the meatballs and added fresh cilantro on top just before serving. Anything with this much cilantro in it has got to welcome cumin too, right? good addition :) I’m glad you liked them! Hahaha- 1/2 the time I can’t even remember what countries we’re going to! I keep saying Zaire, which used to be a country, but we’re really going to two other ‘Z’ countries, Zambia and Zimbabwe. Thanks Regina! 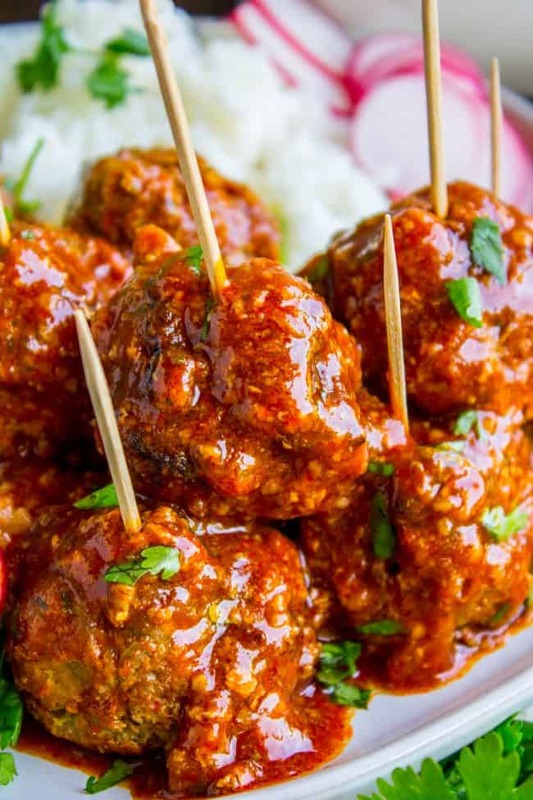 The pepperoni meatballs are really good too, you should definitely give them a try! AMEN I mean Fritos for life, right?? Also, this post is misleading, because I actually love Texas and especially Texans. I think I would really love raising a family there (preferably next door to my sister), but it’s true that if you are going for a vacation there is not much going on! I mean. Unless you count, like, rodeos? And the food in Austin?? Don’t hate me for making huge generalizations lol! !